My horse, I Can Can I (Willow), a reining bred mare I’m showing in dressage. The reader is only allowed to read what is written on the test. The reader may not repeat anything they have already read or offer any other type of communication to the rider (no coaching). If the rider goes off course the judge will direct the rider where to start again and will often direct the reader to begin reading there again. Below I’m going to outline three reasons to have a reader and three reasons to NOT have a reader. There is no right or wrong answer. 1) Fear- Knowing someone is reading can remove the fear of forgetting the test mid-ride and reduce pre-class nerves. 2) Forget- Although you should still learn your test before the show, having a reader can help you if you forget or get confused during your ride. 3) Focus- Having a reader can allow you to focus on your horse without having to also remember the next movement. 1) Unknown- If you haven’t practiced with the reader the timing may be off. You might want to know the next movement earlier…or you might forget if you are told to early. 2) Dependant- Sometimes having someone to lean on can go too far and you will find that you are not fully trusting yourself. This doesn’t mean you can never go back but learning to trust fully in yourself has benefits too. 3) The Zone- Ability to fully focus inside yourself. When you can fully focus on your ride without listening outside yourself, it often opens another level in your riding. I have shown with and without a reader and I have found that the circumstances of the day determine which one I would rather have. If I am riding a new test or multiple tests there is a higher likelihood that I would like to have a reader. I have shown with readers that I know and readers that I did not practice with and both have worked for me. I prefer a reader I have practiced with but I would still consider both options if I felt I needed a reader that day. I have gone off course WITH and without a reader. ‘Off course’ is when you mess up the test somehow. It was not the readers’ fault when this happened…sometimes if your brain checks out even a reader cannot save you. The good news is that I lived through them both. The judge will signal somehow (often by ringing a bell or blowing a whistle) and you will simply ride over to the judge. You will then be instructed on where to resume your test. Rather than ‘reader’ or ‘no reader’ what I would prefer is that I can ride my tests from a consciously competent or unconsciously competent state of mind. Here is a link to an amazing article describing the difference. I know from my past show experience that when I reach this state of riding I will be fully ‘in the zone’. From my past experience, once I get in the zone, I won’t be able to hear anyone except me and my horse. I don’t expect to achieve this overnight or without many mistakes. This weekend I went off course twice because I chose to go without a reader. On the surface, it would be easy for someone watching to wonder why I don’t simply have a reader. I will have a reader again. Maybe when I move to the next level, or I’m really tired, or I’m stressed about something in another area of my life…but there will be many more times that I will pass. I’m ok with making mistakes for one BIG reason. I always learn something from them. When I reflect back on the times I have had the bell rung or the whistle blown I have learned something valuable. The first time it happened I realized that I needed to know the letter placement better as well as the ‘directives’ on the test. Despite the reader reading the test correctly my lack of knowledge held me back. I appreciate greatly that dressage and western dressage offer riders the option of having a reader. I think it is a kindness to the rider and therefore also to the horse. I’d love to hear your take on reader vs no reader and what you have done. Please leave a comment below. P.S.-Always check association rules. At this date, western dressage allows readers for all tests but dressage does have limits at some point (for example some championships, freestyle rides, FEI). Always check the current rules. This is an example of riding ‘in-the-zone’. This is the sire of the mare, I Can Can I (Willow) that I’m showing in dressage. ← How do you pick where you’re going to live? I have never used a reader, for two reasons. First, I would always be afraid that the reader might make a mistake. If there’s going to be a mistake I want to own it, not have it be someone else’s fault. 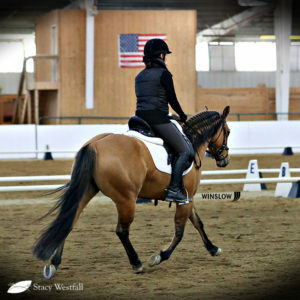 Second, dressage success demands that you be thinking ahead to the next movement because if you want to get the best results from your horse you must set them up properly to transition in a balanced way from one movement to the next. You can’t do that if you don’t know what’s coming next—way before a reader would have called it. If you’re afraid of forgetting parts of the test the solution is the same as for any other performance—you do it enough in the “scary” situation until you become comfortable with it. Great points. It also explains how my highest score of the weekend came on a test I had an error on. I rode the test better, prepared better, used my corners better…but had the one mistake. I’m happy to know that I can recover from the mistake and pick up as strong or stronger than I was riding before. So cool! I love going into a test feeling sure that I know it cold and don’t need a reader. But, if there is any doubt, I feel so much better with a reader to fall back on. I can happily ignore them if I am in the zone and remember it myself. I love filling the down moments in the days before a test going over the ride in my mind both from a birds eye view and a from the saddle view – especially when settling down to sleep. I think you are right about multiple tests being more tricky to do. If I am riding 2-3 different tests, I will probably always need a reader.